During last month’s Franchise Networking Group of Southern Wisconsin quarterly networking event, I had the pleasure of sitting down with nearly 35 fellow members of the Southern Wisconsin small business community to learn more about how the changing workforce is currently affecting our industry and local economy, as well as what changes we can expect to see in the future as FoxConn establishes its presence in the state of Wisconsin. Moderated by Steve Kohlmann, the Executive Director of the Independent Business Association of Wisconsin, the event’s panel discussion was lead by subject matter experts Dave Hagemeier of SuperCuts/Cost Cutters, Dan Schauer of Vanguard Cleaning Systems, Dave Morbeck of ComForcare Senior Services and Arthur Thomas of BizTimes Milwaukee. FoxConn will drive the need for a larger technical, assembly-focused labor force. With the state’s unemployment rate nearly down to 3 percent, it’s likely that we’ll need to seek part of that workforce outside the state lines. Many of those laborers will come from Illinois. Taking into consideration the current labor shortage, employee retention will be a workforce issue at the forefront. A unified culture with strong core values, incentives for success and resources for professional will help retain employment of the labor workforce. In addition to presenting a strong value proposition to potential laborers, small business owners will need to develop stronger hiring solutions to recruit workers. Interested in learning more about workforce trends and the real impact of labor shortages or in participating in the next quarterly meeting? Contact me today with your thoughts! 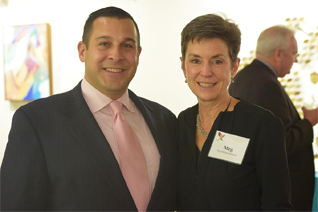 If you’ve always wanted to own a Wisconsin business, Meg will make that dream a reality.